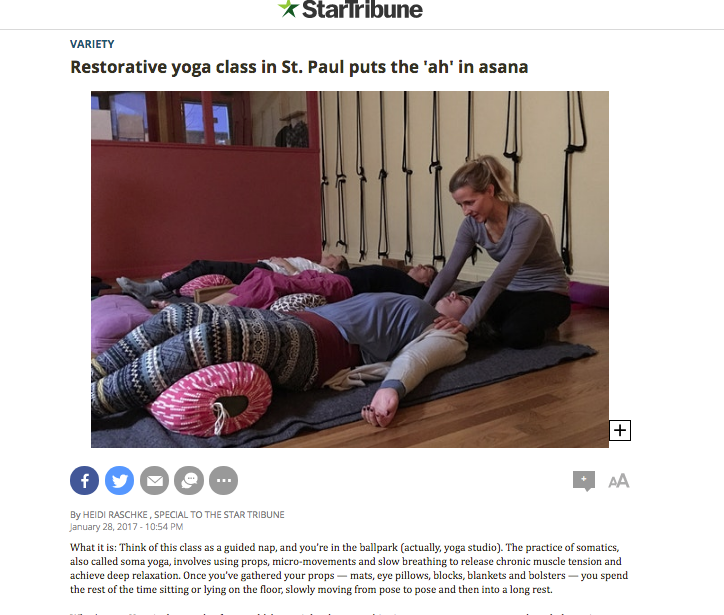 Teacher Maria Toso’s January yoga workshop, focusing on somatics and restorative yoga, received a lovely and brief write-up in the Star Tribune. The text of the article is below. You can also read the original article on the Star Tribune website. What it is: Think of this class as a guided nap, and you’re in the ballpark (actually, yoga studio). The practice of somatics, also called soma yoga, involves using props, micro-­movements and slow breathing to release chronic muscle tension and achieve deep relaxation. Once you’ve gathered your props — mats, eye pillows, blocks, blankets and bolsters — you spend the rest of the time sitting or lying on the floor, slowly moving from pose to pose and then into a long rest. What’s new: Yoga is thousands of years old, but as it has become ubiquitous at gyms, rec centers and workplaces, interest in niche classes that cater to different tastes is growing. I had taken hot, hatha, power and yin classes, but soma yoga was new to me. Who it’s for: There were 19 people at the January restorative yoga and somatics workshop at the Yoga Center in St. Paul — a full house of mostly middle-aged women, several of whom appeared to know one another (and a few who snored during final relaxation). Teacher Maria Toso, a former dancer, told our class she came to appreciate somatics after she found that small, isolated movements could release tension she formerly had treated with routine visits to a chiropractor. I’m guessing the big selling point for many of us, though, was the promise of deep relaxation in a serene candlelit space on a Saturday afternoon. The addiction factor: During the first poses, skepticism set in. How could raising one shoulder an inch off the ground a few times help my achy, stiff neck? Wouldn’t it be more relaxing to hit a massage table, since I wasn’t burning calories anyway? But after two hours on the mat, I felt like I had somehow given myself a deep-tissue massage. Tips for success: Avoid caffeine before class and vigorous activity after class. Keep an open mind. Drink plenty of water before and after. Err on the side of dressing warm and using extra blankets — it’s not relaxing to be cold, and your body is likely to cool down dramatically during the final relaxation. Don’t: Worry about being an experienced yogi, knowing what to do with the props or feeling like an outsider. This gentle, slow-moving class is welcoming and forgiving. Besides, letting go of judgment is one of yoga’s core values. What to wear: Dress like you would for any yoga class, but keep on your socks and add a long-sleeved layer or two for warmth. Comfy and cozy are key. How to participate: Monthly somatics workshops are held at the Yoga Center in St. Paul ($40). Class sizes are limited and do tend to fill up. You can register as well as find more information about these workshops, retreats and other therapies involving soma yoga at mariatoso.com. Heidi Raschke is a Twin Cities writer and journalist.